This section normally appears at the end of the report but the following events now need to be highlighted, especially our 2nd “Come-And-Try-It Time Trial”, as the first one, in June, was a success but due to the very bad weather, there were only 3 riders. We hope that these 3 plus many more will participate – see details below. Meet at Unicorn P.H., Holmes Chapel Road, West Heath at 10 a.m. 15 mile ride to café and 15 mile return – at pace of slowest rider – and not only for Club Members. Team Congleton Olympic Event – No. 2, “Come-And-Try-It Time-Trial” – Thursday, 30th August. Distance – 2.5 miles. Meet at 6.30 p.m. – Brereton Country Park Visitor Centre. This is for all cyclists – of 12 years and over – and especially novices. Riders will start at one minute intervals and the course around Brereton Heath, Somerford and A54, will be well signed and well marshalled. The Awards will include many Age Categories. 210 km ride to the Horseshoe Pass or 168 km ride to the Chirk Aqueduct near Llangollen. Enter 210km or 168 km by down-loading entry forms from AUDAX UK. Great turnout of 31 riders (21 Club riders + 10 guests) for the last 10-miler of the year on the Chelford course. Winner was Paul McAllister (Seamons CC) with a time of 22:28; second was Pete Tatton with 23:25 narrowly beating Pete Smith with 23:28. The 2 youngest riders both recorded PB’s: Bethany Eardley with 31:03 and Harry Akers Smith with 32:30. Full Result: Paul McAllister (G) 22:28, Pete Tatton 23:25, Pete Smith 23:28, Brendan McLaughlin 23:59, Alan Burton (G) 24:01, Keith Dutton (G) 24:02, Andy Malbon 24:05, Stephen Jackson 24:27, Kelvin Milward 24:42, Jamie Willetts 24:45, Paul Kirman (G) 24:51, Wayne Powell 25:11, Jonathan Beever (G) 25:28, Mike Jones 26:06, Warren Jackson (G) 26:37, Sheldon Starkey 26:47, Duncan Poole 27:05, Tony Elliott 27:37, John Green (G) 27:43, Jon Leigh 27:51, Nick Wood 28:30, Richard Hunt (G) 29:00, Angelo DeAngelis 29:03, John Broadbent 29:19, Peter Nelson 30:36, Bethany Eardley 31:03, Harry Akers Smith 32:30, David Hurst 33:08, Claire Thomson (G) 33:24, Phil Gayes (G) DNF(P), Steve Hulme DNF(P). One second separated the top two riders this evening: winner was Nige Wood (Wills Wheels) with a time of 22:17; second was Martin Parish (Crewe Clarion) with a time of 22:18. 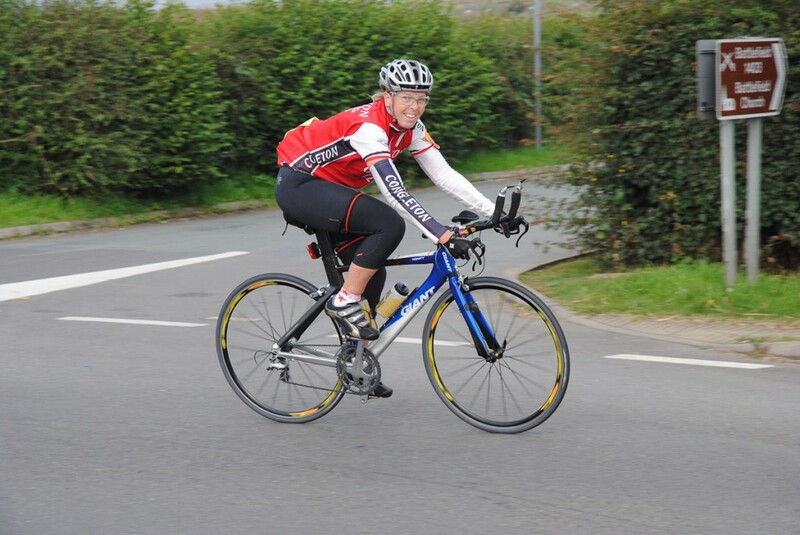 Fastest Congleton rider was Pete Tatton with a personal best time of 23:08. Full Result: Nige Wood (G) 22:17, Martin Parish (G) 22:18, Pete Tatton 23:08, Keith Dutton (G) 23:11, Pete Smith 23:13, Andy Malbon 23:39, Chris Guest (G) 23:53, Phil Gayes (G) 24:17, Dave Croft (G) 24:19, Kelvin Milward 24:49, Mike Jones 25:39, Dave Farmer (G) 25:42, Sheldon Starkey 25:54, Duncan Poole 26:50, Nick Wood 27:46, Tony Elliott 28:12, John Broadbent 28:38, John Swinnerton (G) 30:59, Claire Thomson 31:47, David Hurst 32:34. Our Club had 4 riders: Kelvin Milward was our fastest with 24:13, followed by Duncan Poole, 26:44, then Peter Nelson, 30:56 and Peter Hayhurst, 32:05. The top 8 riders were all from 100% ME (Development Squad youngsters), the slowest of which recorded 20:51, the fastest (winner) being Sam Harrison with a very fast 19:32. The warm evening attracted 28 riders so some fast times were recorded. Winner was Jack Green (VC St Raphael) with 21:10; second was Nige Wood (Wills Wheels) on his trademark fixed gear with 21:31; third and fastest of the Congleton riders was Steve Hulme with 22:16. Full Result: Jack Green (G) 21:10, Nige Wood (G) 21:31, Steve Hulme 22:16, Pete Smith 22:40, Pete Tatton 22:50, Keith Dutton (G) 22:55, Anthony Alan (G) 23:37, Phil Gayes (G) 23:37, Andy Malbon 23:40, Dave Croft (G) 23:42, Kelvin Milward 24:37, Wayne Powell 24:37, Mike Jones 24:52, Sheldon Starkey 25:20, Andrew Doorbar (G) 25:37, Tony Elliott 26:09, Warren Jackson (G) 26:09, Duncan Poole 26:17, Jon Leigh 26:55, John Green (G) 27:30, Nick Wood 27:31, Denise Hurst 27:34, John Broadbent 28:35, Angelo DeAngelis 28:47, Claire Thompson 29:28, Bethany Eardley 29:54, Peter Nelson 30:27, David Hurst 31:51. Georgina Norton, Peter Nelson and Doug Taylor formed the B run and the faster riders, Sue Collins, Richard and Tom Cowan, Steve Kirkham and Pete Smith, formed the A run, so as to ride at 2 speeds but all met at the Station café. It worked well and everyone was happy! After lunch the 2 groups set off separately. The B group came back through the lanes and had a second stop at Minshuls Garden Centre, finishing with 68 miles. The A group did more main road and were faster but did 5 miles less – so honours even. Another fine warm evening for the last time trial of the year attracted 28 riders including 6 newcomers riding their first race (no doubt inspired by the Olympics!). Clear winner was James Tucker (Pennine RC) with a stunning time of 20:58 for this course; second was Steve Hulme with 22:51. Full Result: James Tucker (G) 20:58, Steve Hulme 22:51, Pete Smith 23:43, Pete Tatton 24:02, John Swinnerton G) 24:36, Jamie Willetts 24:41, Phil Gayes (G) 24:53, Nick Decker 24:59, Stephen Jackson 25:17, Andy Malbon 25:28, Kelvin Milward 25:58, Mike Jones 26:04, David Clark (G) 26:08, Sheldon Starkey 26:39, Bill Green (G) 26:48, Robert Kerr (G) 27:11, Jon Leigh 27:38, Andy Green (G) 27:44, Tony Elliott 27:55, Chris Bottomley (G) 28:20, Niige Wood 28:32, John Green (G) 28:33, Fred Green (G) 8:46, Angelo DeAngelis 29:34, Tom Cowan (G) 29:53, David McVitie 30:07, Claire Thompson 31:13, Peter Nelson 32:53. This annual open event was organised by Kelvin Milward and was extremely well supported by Members, including 7 of the 69 entries plus 19 helpers (including family / friends). Unfortunately, our Club Secretary, Denise Hurst, was unable to start as she is still recovering from her fall in last week’s 12-hour TT. The conditions were excellent, with warm sunshine and a light breeze – so riders and marshals were well-pleased. The winner was Simon Bridge, Manchester Wheelers, with 01:47:38. Members’ times: Pete Smith, 02:07:51; Pete Tatton, 02:10:09; Andy Malbon, 02:11:28, Wayne Powell, 02:17:57; Peter Nelson, 02:58:29 (Over-70 winner), Peter Hayhurst, 03:04:26; David Hurst, 03:07:26. Helpers: Bob & Georgina Norton, Rob & Avril Waghorn, Pat & Peter Hayhurst, Linda Scragg, Mary Renshaw, Stephen Kane, David McVitie, Jean Lester, Les Lancaster, Angelo de Angelis, Sheldon Starkey, Nick Decker, Duncan Poole, Colin Mason, Bill Boynton, Roy Hayhurst. The Club meets every Thursday at 8.30pm at the Rugby Club, Park Street, except for the first Thursday of the month where the venue is Beartown Tap. Anyone who would like to swap ideas and stories on all cycling topics is welcome to attend.